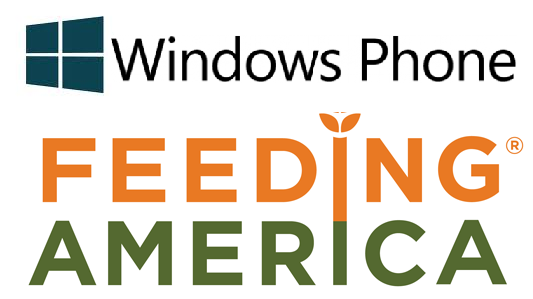 I have seen logos of “Feeding America” here and there, and seen TV Spots too, but I never realized they are pretty huge, so when I read on WPCentral about them ditching BlackBerry phones for Windows Phone, of course I got interested. The news today is that they are DUMPING Blackberry and going Metro (Windows Phone). CHICAGO — May 15, 2012 — Feeding America, the nation’s leading domestic hunger-relief charity, left its support of Blackberry devices in favor of Windows Phone. The move strengthens Feeding America’s capabilities as it complements the organization’s use of other Microsoft solutions including Microsoft Office 2010 and Microsoft Lync Server 2010. In an effort to be fiscally responsible, Feeding America conducted a review of its former Blackberry environment and explored other wireless devices, including Android, iPhone and Windows Phone. By migrating from Blackberry to Windows Phone, the company discovered it could avoid costly annual server maintenance expenses. In addition, the organization’s move has resulted in several benefits, including a 24 percent reduction in cost per device and improved access to the information and IT services that employees rely on to collaborate and be productive. “Windows Phone provides a level of integration with Microsoft Exchange Server 2010, Microsoft SharePoint Server 2007 and Lync Server 2010 that are not available with the iPhone, iPad or Android,” said Kevin Lutz, vice president of Technology at Feeding America. Feeding America was particularly satisfied with the ease of interoperation between Windows Phone and its existing Microsoft products. It was also impressed with the excellent end-user experience, which was seamless, coherent and familiar across all Microsoft products and services. In summary, what they are saying is that they conducted a re-evaluation of their wireless devices (which was Blackberry phones) and compared with other mobile platforms (iPhone, Android and Windows Phone) and after re-evaluating, Windows Phone came out on top, the reason of course is simple, see Feeding America already runs multiple Microsoft software solutions in its organization, solutions like Microsoft Lync, Sharepoint, Exchange Server, Microsoft Office Suite and adopting Windows Phone offers seamless connectivity and integration between all devices. The reason behind this article really is to show that this is the start of something huge in the US (and for struggling Nokia especially), as more companies (those that run in a Microsoft Server environment) begin to realize the many fiscal and other benefits of using Windows Phone over Android/iPhone.